Learn more about some of the best activities for older adults. We often hear about the importance of the arts in our children’s education, but what about when we grow older? 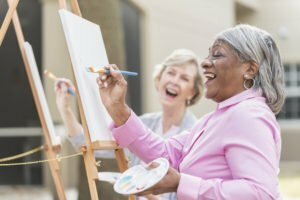 Art plays a valuable role in learning throughout our lives, and is, in fact, one of the best activities for older adults because of the many benefits it provides. For many older adults, in particular those who have lost a spouse or who struggle with getting out because of mobility issues, everyday life can become monotonous and feelings of despondency and isolation are common. However, the addition of activities for older adults can help combat these feelings and provide a therapeutic way for older adults to express themselves. Incorporating arts and music into daily care not only provides emotional enrichment, but can significantly enhance quality of life and even improve the senior’s physical and mental capacities. Research conducted by CoroHealth Music First found that agitation and depression decreased by as much as 54% when older adults were routinely exposed to music they enjoyed. And we at Hired Hands Homecare, providers of the senior care Santa Rosa, CA families trust, aren’t surprised – music is a source of comfort for all of us. We have found the rejuvenating effects of music and art to be especially important in our Santa Rosa home care services. If you have a loved one in need of dedicated, enriching home care services in Marin, Sonoma, Napa counties or the Tri-Valley, contact Hired Hands Homecare to learn more about our services. Art and music can also benefit in many other ways. But most importantly, if you consider, these are greay ways to increase socialization for seniors who feel lonely and isolated due to many health and lifestyle factors.